One of the coolest consoles, if not the coolest console, to ever see the light of day, NEC's PC Engine, is celebrating its 24th birthday today. For those of you who are a bit mathematically challenged, that means the sleek little system below was "born" on Oct. 30, 1987. I'm sure I've told this story before, but in case I haven't: I've been interested in (some would say obsessed with) this console ever since I laid eyes on it in an early issue of either Electronic Gaming Monthly or GamePro magazine. Although I acquired a TurboGrafx-16--the PC Engine's North American cousin--shortly after it was released, I didn't add a PC Engine to my collection until two years ago. It should go without saying that the shockingly small system (it's about the size of three or four CD cases stacked on top of one another) is one of my most-treasured pieces of gaming paraphernalia. 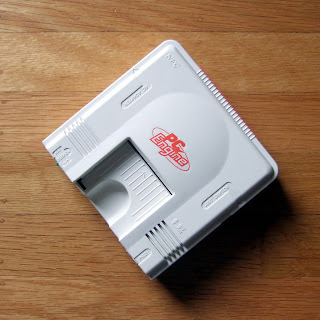 Anyway, please join me in raising an imaginary glass of bubbly to the "little white wonder," as I like to call the PC Engine, for surviving its awkward teen years and for blossoming into the beautiful 24-year-old we know and love today. Also, join me in playing a few of its most noteworthy games. 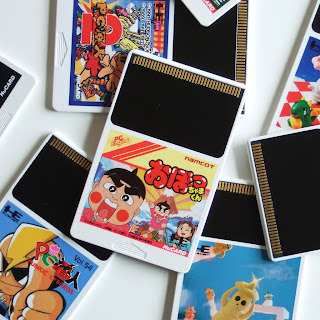 Some of the ones I'm planning to spend time with this afternoon: Air Zonk (aka PC Denjin), Bomberman '94, Final Match Tennis and Parasol Stars. Thanks for the info! I must post these news as well! Very important for such a neat console! Which games have you played, by the way? Really have to get myself one of these. Need a job first though! Said it before and I'll say it again - you take great care of your stuff! Retr0gamer: Yes, a job first sounds like a good idea to me. Sorry you're finding yourself in that position, by the way. Hmmm, the second two are good ones. What did/do you think about Shockman, though? I don't think I've ever played it, to tell you the truth, but I've heard not-so-great things about it. Maybe I'll download Air Zonk on the VC today...is it worth it? If you like shoot 'em ups -- cute-ish ones, especially -- then, yes, it's definitely worth it, Justin. Air Zonk has great tunes and graphics, TONS of parallax scrolling and a really fun "partner" system. Thanks for the link, Matthew. I just checked it out. Being a huge Alien/Aliens fan, it seems I'll need to check this out pronto. Based on what you've said and what a few others have said about the game, I'm guessing the repetitive nature of the game will get to me at some point, too, but that's no reason to not at least give it a go, right?